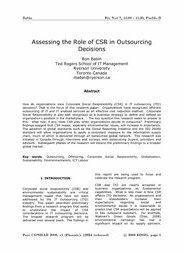 How do organizations view Corporate Social Responsibility (CSR) in IT outsourcing (ITO) decisions? That is the focus of this research paper. Organizations have recognized offshore outsourcing of IT and IT enabled services as an effective cost reduction method. Corporate Social Responsibility is also well recognized as a business strategy to define and defend an organization’s position in the marketplace. The key question this research seeks to answer is this: what role, if any, does CSR play when organizations decide to outsource? Preliminary findings suggest that CSR issues, especially environmental issues, will increase in importance. The adoption of global standards such as the Global Reporting Initiative and the ISO 26000 standard will allow organizations to apply a consistent measure to the information supply chain, much of which is delivered through an outsourced global network. This research was initiated in Canada through interviews and surveys with outsourcing buyers, providers and advisors. Subsequent phases of the research will extend the preliminary findings to a broader global market.